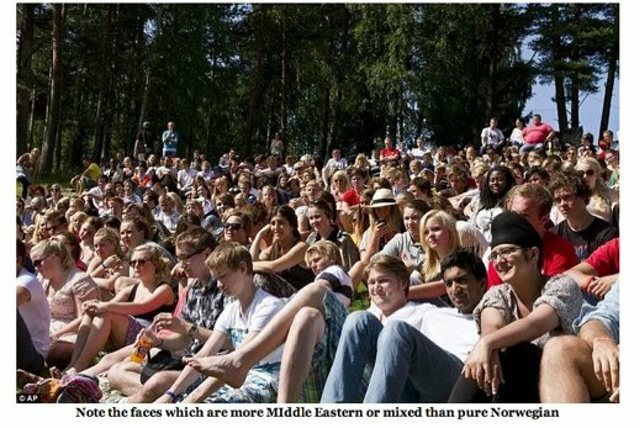 Pamela Geller has since redacted this caption from a blog post about the Oslo youth camp victims, seen here in an AP photo a day before the bloodbath. When the old blog post came to light in the media, Geller responded by scrubbing out the sentence about stockpiling weapons. After she was called out on it, she put it back in, explaining that "The sentence I edited is not an incitement to anything. It refers to self-defense, but I removed it in the light of recent horrific events in Norway. I thought it insensitive. Nothing more. Everyone has a right to self-defense." I abhor violence (except in regard to self defense). But the jihad-loving media never told us what antisemitic war games they were playing on that island... The camp was run by the Youth Movement of the Labour Party and used to indoctrinate teens and young adults. Breivik was targeting the future leaders of the party responsible for flooding Norway with Muslims who refuse to assimilate, who commit major violence against Norwegian natives, including violent gang rapes, with impunity, and who live on the dole... all done without the consent of the Norwegians.